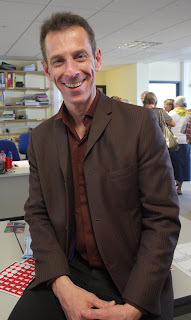 The main pleasure of the Readers' Day at St Austell was meeting other people: enthusiastic readers and librarians and other authors too. 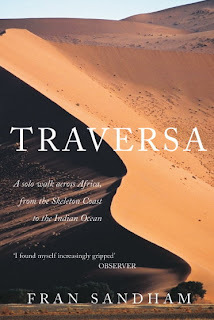 It also meant I came across some excellent books, and one of these was Traversa by Fran Sandham. 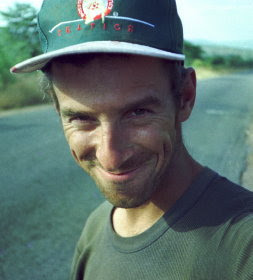 Fran, a seasoned travel-writer, decided to challenge himself to walk across Africa. Traversa is the book of this epic journey. I expected it to be interesting and adventurous, but I didn't expect it to be entertaining too. Fran Sandham is a witty writer with a refreshingly self-effacing take on life. The humour is there from teh beginning. For instance, when he starts walking from the evocatively named Skeleton Coast, he does so with a colossal hangover - an unfortunate condition for a man about to cross one of the driest places on earth with limited water. Water, was just one of his problems. For a journey like this, where you have to carry everything you need to survive with you, the load is onerous. Because of this he decides that maybe he could do with the assistance of a beast of burden and his tales on dealing with the various rangy animals and their equally stubborn owners makes one of the many funny sections of the book. He then carries on across the continent, encountering all sorts of climates and people which give him ample opportunity to share anecdotes and fascinating snippets of what is still, for most people, an unknown and mysterious continent. Fran Sandham was an editor at Rough Guides for several years, and worked in bookselling and in the voluntary sector before that. He has travelled in over fifty countries. He now lives in London and Wirral, and divides his time between freelance writing and public speaking. He has written for many newspapers, magazines and travel publications, including the Sunday Times, the Daily Telegraph, the Observer, the Financial Times,Adventure Travel, Traveller magazine, Travel Africa and Country Walking. For more information see his website. CD: Was there a point on your journey when you were really scared? FS: Not really, I was more scared before the journey about potential risks - and even more scared of the implications of not going at all. Once I was there I just got on with it. CD: Alcohol features hilariously throughout the book. I guess you must have often regretted a hangover in the desert; but was there any time the alcohol was actually a help? FS: Yes, often, for all the same reasons as back at home. Though I noticed the effects of alcohol more when I’d stopped walking for a few days and spent a few nights partying. CD: Which character from your journey do you remember the most vividly (or the most gratefully)? FS: Harry, a white farmer in Namibia who was ‘helping’ me during the donkey/mule fiasco, a man of very fiery temperament. Sadly he died the following year. CD: Was it difficult to get a publishing contract for your account? FS: Yes, it took ages. It’s not traditional travel writing, so I think quite a few editors didn’t quite ‘get it’. It certainly had a lot of rejections. CD: Were there things you missed out from your account - if so, why? FS: There are a great many things missed out from the account. After all, a normal-length book isn’t that much space to describe a whole year’s journey and one can have too much of baring the soul, or even reading about such a thing. If a book gives the impression of being the whole story then it’s doing its job effectively, but it’s just an illusion. CD: You write about other great African explorers, notably Livingstone and Stanley; but are there any more modern travellers you particularly admire? FS: Ranulph Fiennes - I admire his toughness and his reluctance to let advancing years stop him from doing things he wants to do. I quite like Bruce Parry, who seems to get on well with the people he meets. I tend to prefer well-known travellers at the beginning of their careers - when they get too well known on TV their stuff can get a little over-produced and can come across as completely scripted rather than occasionally spontaneous. I guess in general people on the way up are often more interesting than those at the height of fame, and tend to put more effort into their creative material). CD: Do you have any tips for the would-be traveller? Are there any special tips for the travelling writer? FS: Avoid donkeys and other pack animals like the plague. Travel writing – avoid flowery descriptions, tell a story, make a point. Too many travel articles and even travel literature books don’t say anything, or at least nothing much worth saying. FS: I’m not that big a fan of snails, apart from Brian in 'The Magic Roundabout', although I don’t believe he’s based that closely on a real snail. I’ve never eaten escargot and would only do so if literally starving. I saw some very large snails in East Africa after heavy rainfall. FS: I'm still waiting for this. FS: Every single event is life-changing. FS: I’d rather not say. FS: I would like to transform myself into one of the idle rich. FS: Living with purpose, and being allowed to be oneself.